← What If? Rejects #3.3: Umm…? I reviewed Noah last spring with a follow-up post on the finer points of the film’s theology. I thought that film was pretty good, but you had to be willing to think deeply about its message and not just watch it casually. 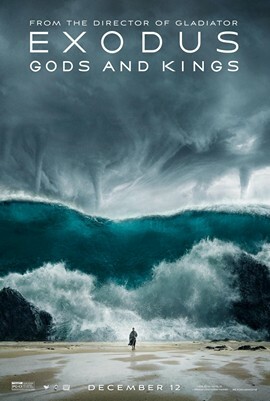 I finally got around to watching Exodus: Gods and Kings, and I’m sorry to say that it lacks both the quality and the depth of Noah. Exodus is another epic Biblical film starring Christian Bale as Moses, which could have been very good, bu the execution was poor throughout. The first half hour was actually pretty good, but had nothing to do with the Biblical story of Moses. It shows Moses as a general in Pharaoh’s army, fighting the Hittites and generally being a better leader than his adoptive cousin, Ramesses. It’s a nice sequence, but the Biblical Moses probably wasn’t that smart, nor that good of a public speaker, and his intelligence had very little bearing on the rest of the movie, ultimately proving ineffective, after which God’s intervention begins. Another point that never seems to come up in any adaptation: Moses almost certainly knew he was a Hebrew from his youth. I think it would be interesting to see his story told from that angle, but Ridley Scott chose not to do it. From there the movie goes into a poor attempt at making the Biblical story more interesting, mainly by playing fast and loose with it. Moses is exiled by Ramesses because his Hebrew heritage is discovered, more so than because of his murder of an Egyptian guard. Later, when God calls him back to Egypt, he leaves his wife and son behind at Mount Sinai instead of taking them with them. He doesn’t use a staff to call down the plagues; rather, he is told by God to sit back and watch Him do everything. And even if you don’t mind playing fast and loose with the story, the screenplay was not all that good and dragged a lot. The movie’s real redeeming part was the Red Sea sequence. I thought that was both visually and narratively very well done. Instead of the Red Sea parting instantly into walls of water, a storm and a strong current cause the water to flow away overnight. This is the only time I’ve seen Exodus 14:21 depicted in an adaptation: “Then Moses stretched out his hand over the sea, and all that night the Lord drove the sea back with a strong east wind and turned it into dry land. The waters were divided” (NIV). This sequence was really enjoyable, but sadly not enough to salvage the rest of the film. This entry was posted in Movie Reviews, Religion and tagged bible, christian bale, exodus, exodus: god and kings, moses, ridley scott. Bookmark the permalink.